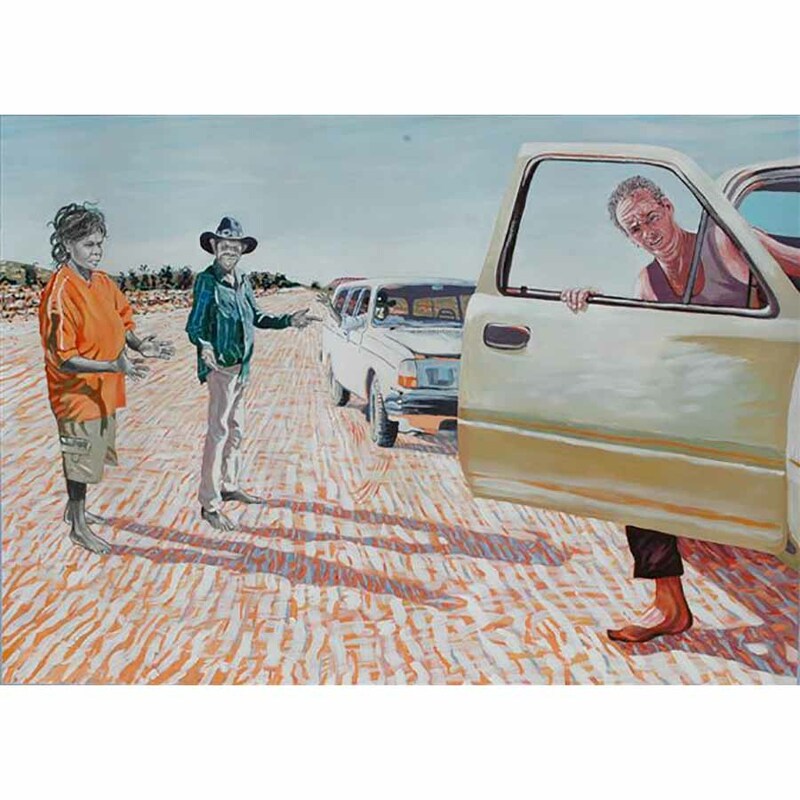 After graduating from a Masters of Art at Monash University, Rod moved to Alice Springs. 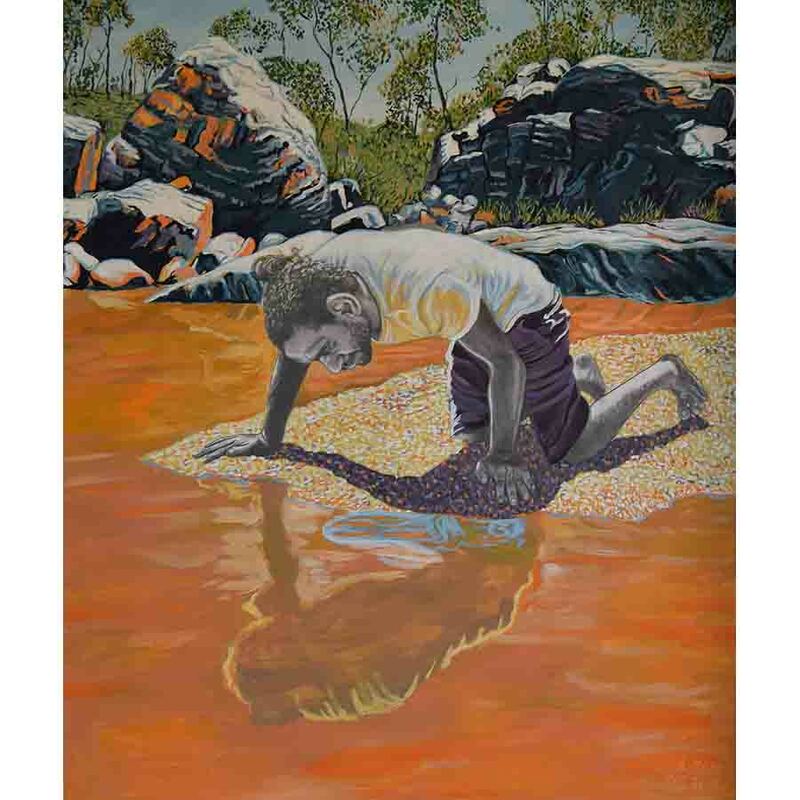 His drawings and paintings are full of arresting imagery that offers viewers a closer look into Aboriginal daily life in the desert. 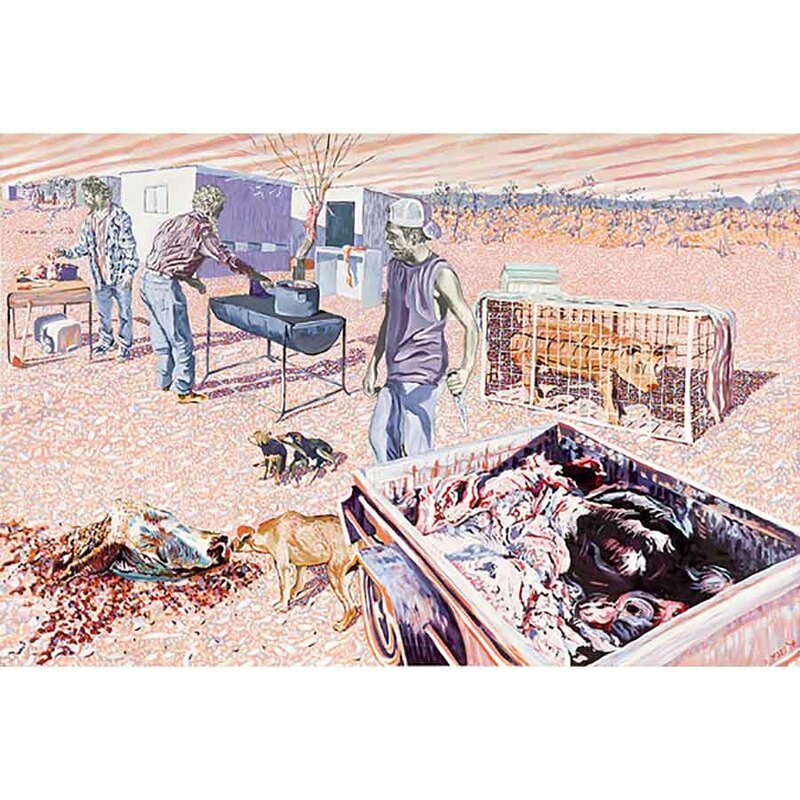 Often perplexing but always engaging, Rod’s graphic works can appear both mundane and sardonic. 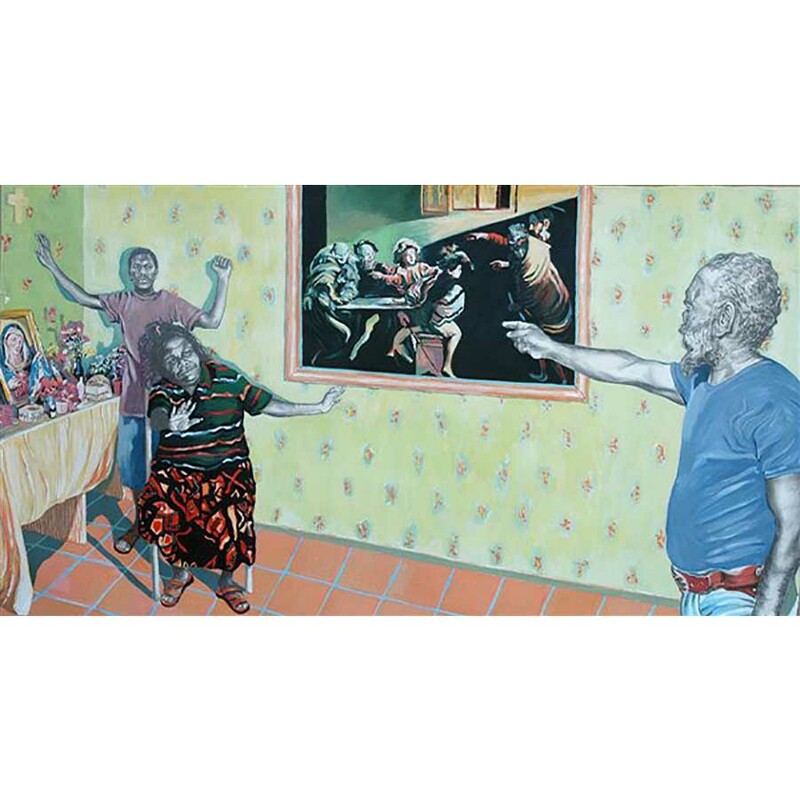 Suggestive poses by the Aboriginal subjects simultaneously challenge both our knowledge and ignorance of Indigenous life, with Rod often wryly quoting famous masterworks from European painting history including those of Manet, Bellini and Caravaggio. 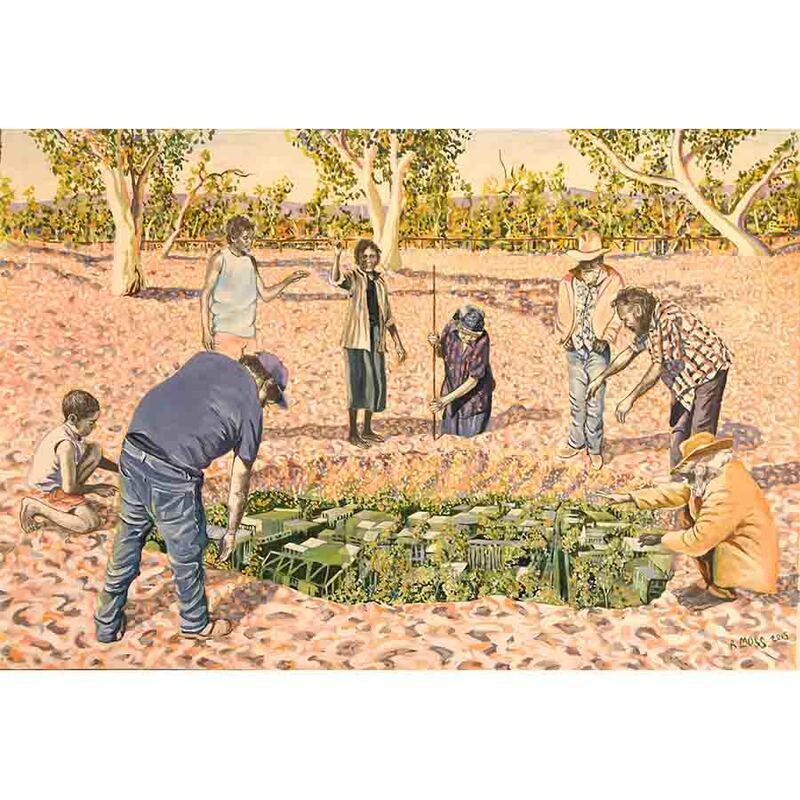 Since 1984, Rod has won or been acquired for various awards in the Alice Springs region, including The Alice Prize, The Tennant Creek Prize and the Northern Territory Art Award. 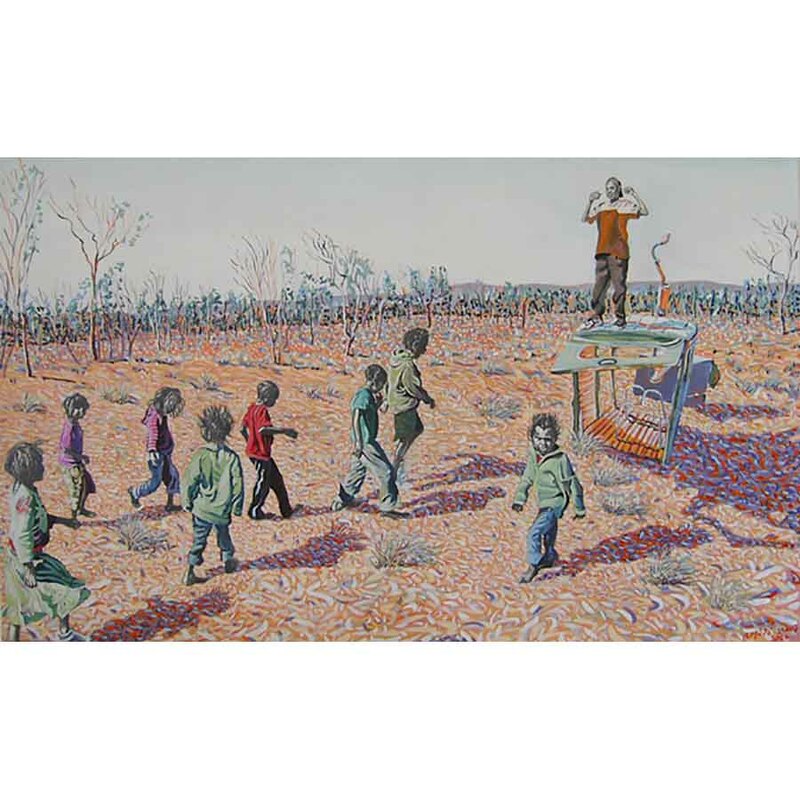 His works are held in numerous private, corporate and public collections nationally. 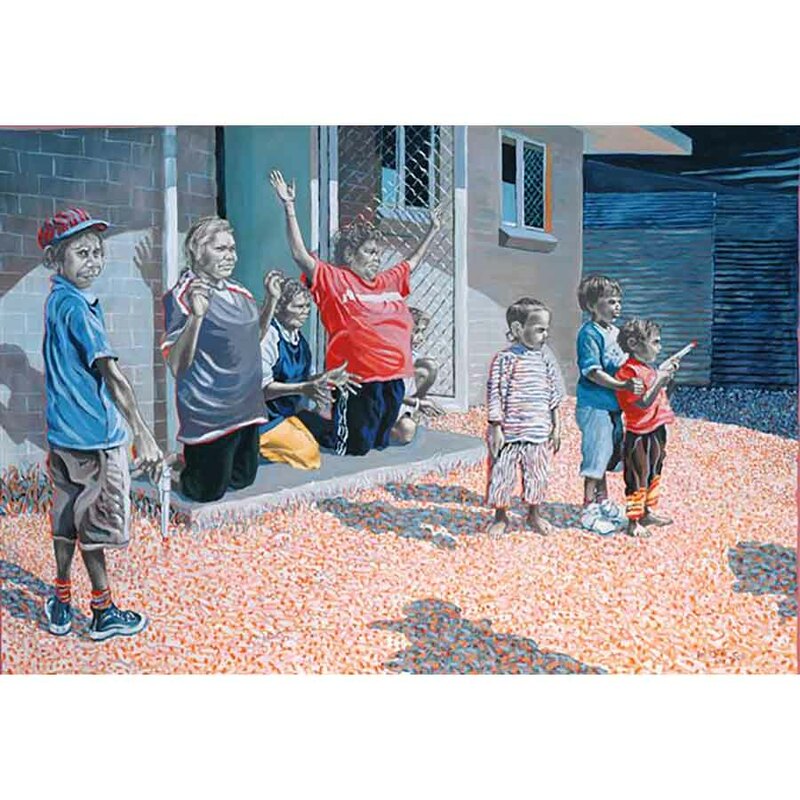 Through his painting and drawing Rod interprets the cultural interface between Indigenous and non-Indigenous people in Central Australia where he resides. Using graphite and synthetic polymer paint he carefully constructs narratives that challenge conventional images and endow his subjects with a common humanity. The blinding light of the desert environment renders a new way of seeing and elicits a gentle interrogation of the nature of what is accepted as realism. 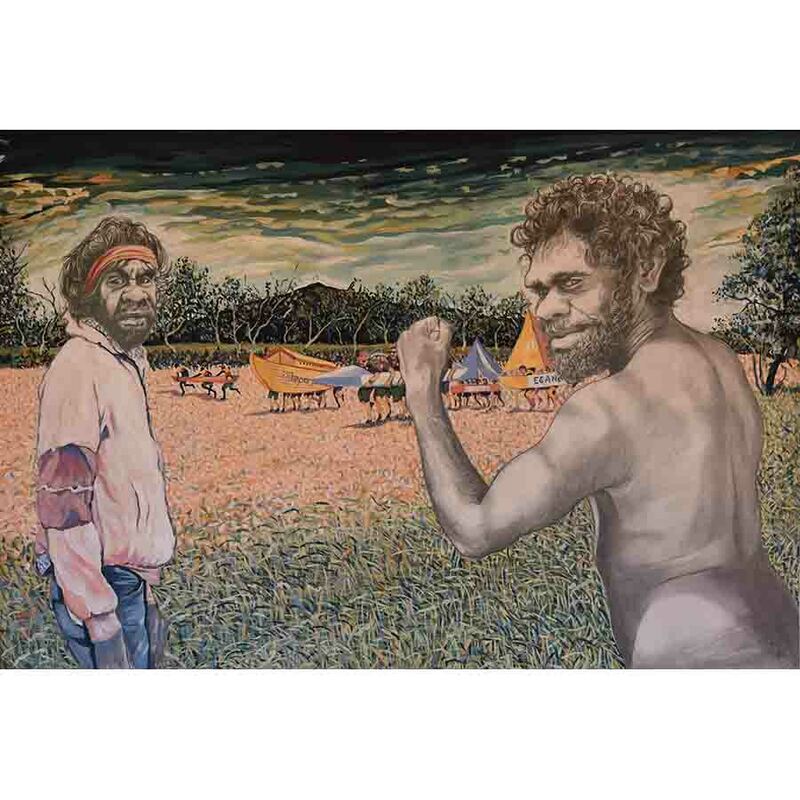 I witnessed Johnathon Loo-Hayes chasing some Whitegate women with a dead King Brown behind the Eastside shops and later thought of re-enacting the scene in camp. Unfortunately, when I went to retrieve the snake it had gone. We set up with a bit of rope on a stick, but these shots somehow got lost. Next week, while doing the evening rounds, dropping kitchen scraps for the camp dogs from Topsy Smith Nursing Home, Johnathan called me to where he’d just killed another ‘Brownie’. It was, afterall, snake season and we’d secured our model. 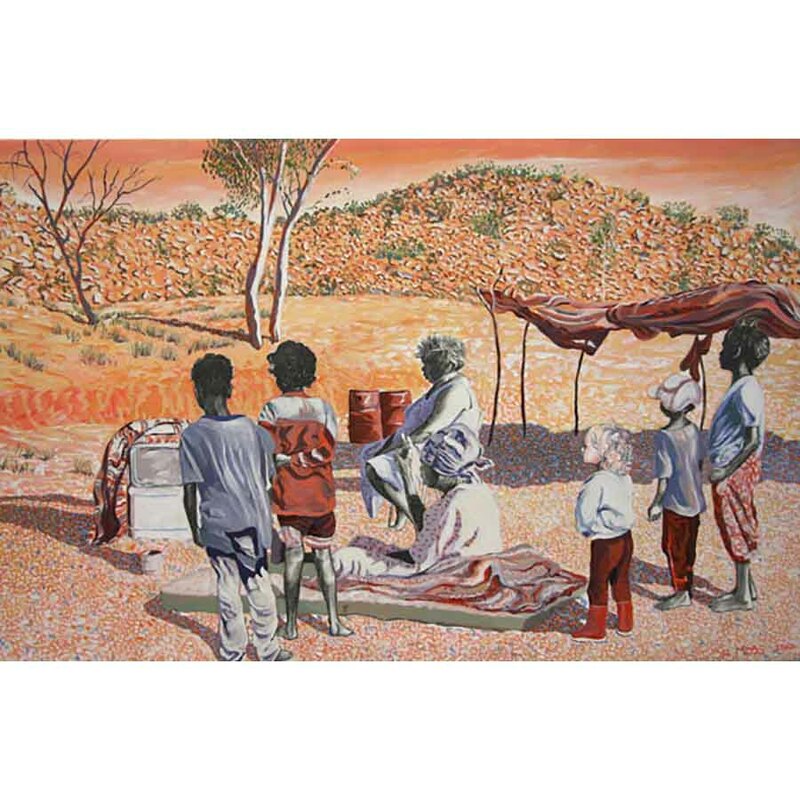 This painting derives from photos taken by my friend, Tom Psomotragos, between 1990 and 1991 when he camped with the Whitegate families. What resulted were four astonishing graphic black & white folios documenting the time, place and people. I collaged several of these for this composition and added the galah flock to spice the drama. Singing the Country and the title of Arrernte author, Kathleen Wallace’s superb book, Listen Deeply to Country suggested this fantasy. Many people regard the land as being saturated with spirit entities. Whatever, I’d long harbored the desire to reposition Albrecht Durer’s beautiful angel. The Coulthard children, when asked if they’d like to be in a painting, jumped at the chance. Rodney junior had been playing with a guitar soon after he could walk, encouraged by and imitating his father, a gifted musician. Roxanne Neal asked me to make a work commemorating her recently deceased father, Edward. She went into their dwelling and emerged with his cowboy hat and placed it on a chair to photograph. I was surprised. I’d attended several funerals of legendary horsemen where their hat was placed on top of the casket and interred with it. I pondered the photo during that week unclear as to what to do. When I returned to help recycle cans and plastic bottles collected by widow, Bonita, Roxanne assembled her daughters, grandchildren and mum for a group photo. She suggested relocating them before akngwelye apwerte/, the puppy dog Dreaming hill that can be seen from their dwelling two hundred meters distant. Having grown up proximate to it, the children inherited its stories. 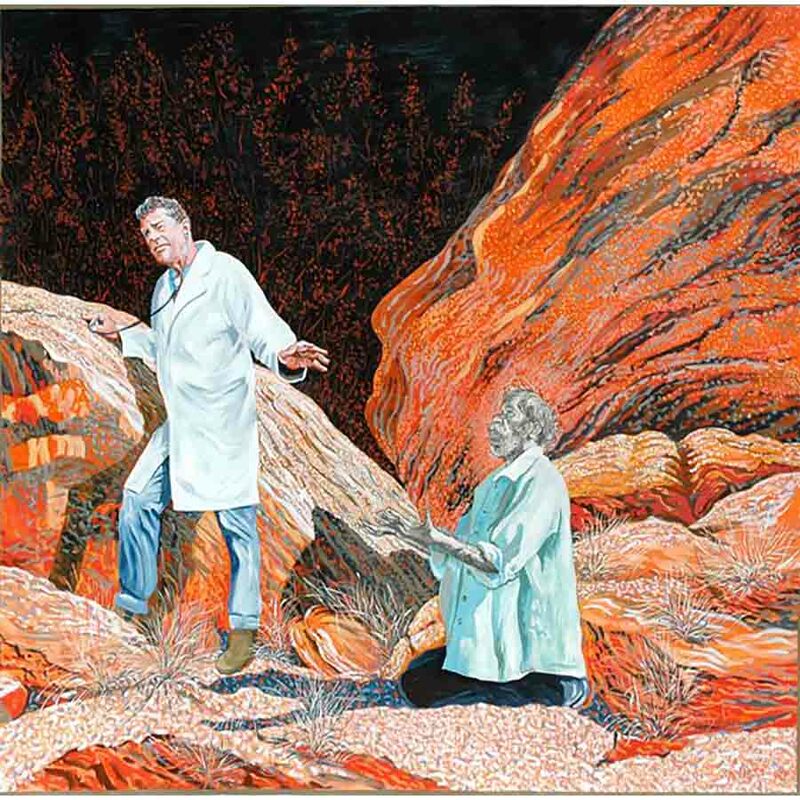 Inspired by a couple of etchings by Goya from his Disasters of War folio, and ongoing debate about the place of Colonizer’s monuments, I figured Ronnie Webbn and Gerald Rice about to heave the statue of Athemis, the Greek Goddess of Justice ice into the pit along with John MacDoull Stuart ( a particularly contentious Alice Springs piece, Burke & Arthur Phillip). 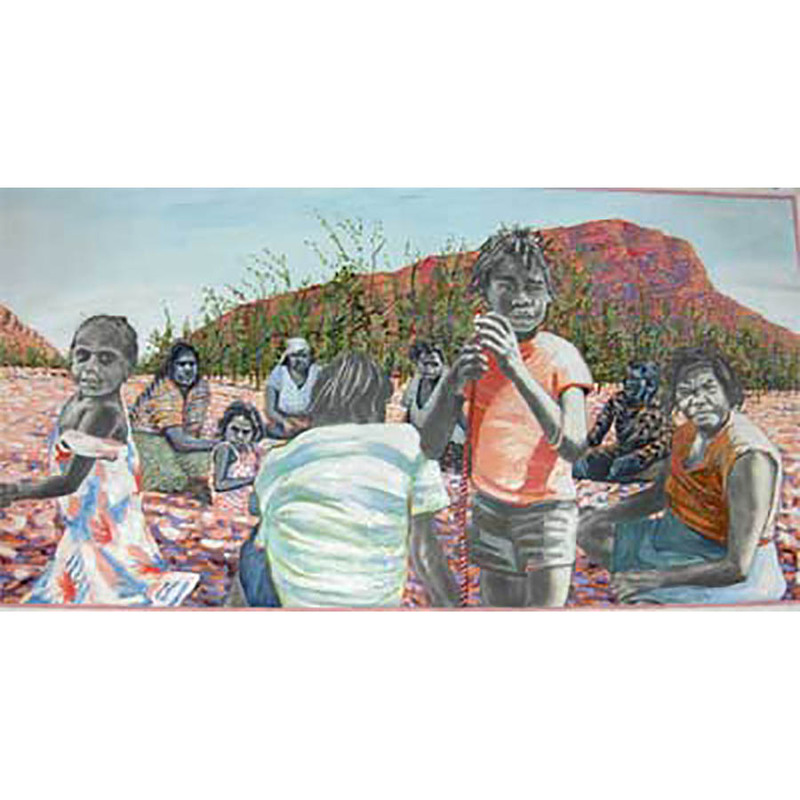 James Cook is about to join the procession on the ridge overlooking Alice Springs nestling in the Larapinta Valley. High above the town a group of indigenous kids tug-o -war with unseen combatants. In the valley below, nestles the gridded city of Alice Springs. In the distance, Heavitree Gap, where in another painting, Sisyphus struggles to ‘close the gap.’ Two contestants mask their identity. And what is the prize? A farce in reality deserved farcical treatment. The annual August Alice Springs Henley On Todd attracts massive crowds both locally and from elsewhere. The event doesn’t interest Jude Johnson at left, whose red headband expresses more serious concerns (an indication that he has been attending law-making initiation business). Clifford Webb, echoing Goya’s, Colossus, happily urges on the team of three indigenous lads leading the field. Next, though travelling blind-sided, are a team representing local indigenous TV station, Imparge, bearing Noah’s Ark. Compositionally, I also borrowed from the Spanish master his dark ambience, silhouetted range (Anzac Hill) and foreground wedge of buffel grass, an environmental scourge. Variously functional cars were gathering number at Whitegate Camp. One afternoon, a rival faction of the family who’d been arguing for months, waited until the place was vacated for the afternoon to enter and smash all windows of every car. When I was told about the damage done to the cars and asked if I’d photograph the damage to help with a report to the police I started thinking of a painting. Mark Tansey’s, Pleasure of the Text, came to mind. 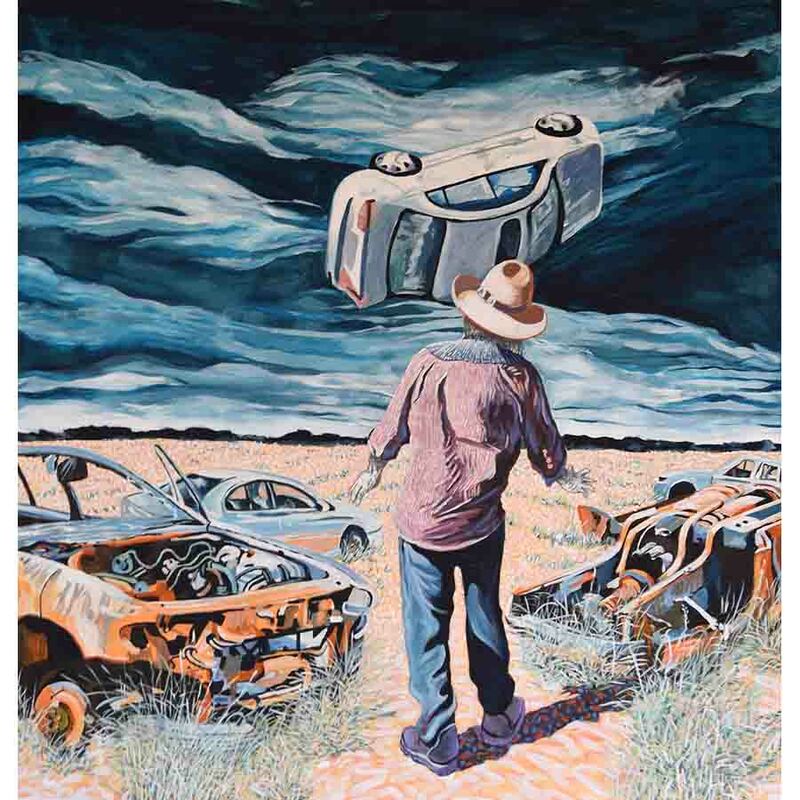 Edward Neal was happy to echo the pose of the driver in Tansey’s piece only I wanted Edward’s hands to express astonishment at the levitating, intact, or reborn, vehicle. Narcissus was out hunting one day when Echo saw and fell in love with him. She followed him and talked with him. She had never seen anyone as beautiful and declared her love for him. When he rejected her she was broken hearted and disappeared leaving only her voice. Nemesis, the goddess of revenge, punished Narcissus by leading him to a pool in which he saw an image so beautiful he became enchanted and visited the pool daily to gaze at it. Ultimately, he realized that the image couldn’t love him or exist independently of his act of looking at it. His love was obsessive and unrequited. He was enthralled by a reflection, a reversed image he hadn’t seen before, not as he knew himself to be. The story of Narcissus has special appeal to realist artists and he has sometimes been regarded as the inventor of painting. Renaissance theorist Albertis explained, ’What is painting but the act of embracing by means of art the surface of the pool?’ I’d considered alternate reflected images in the water. 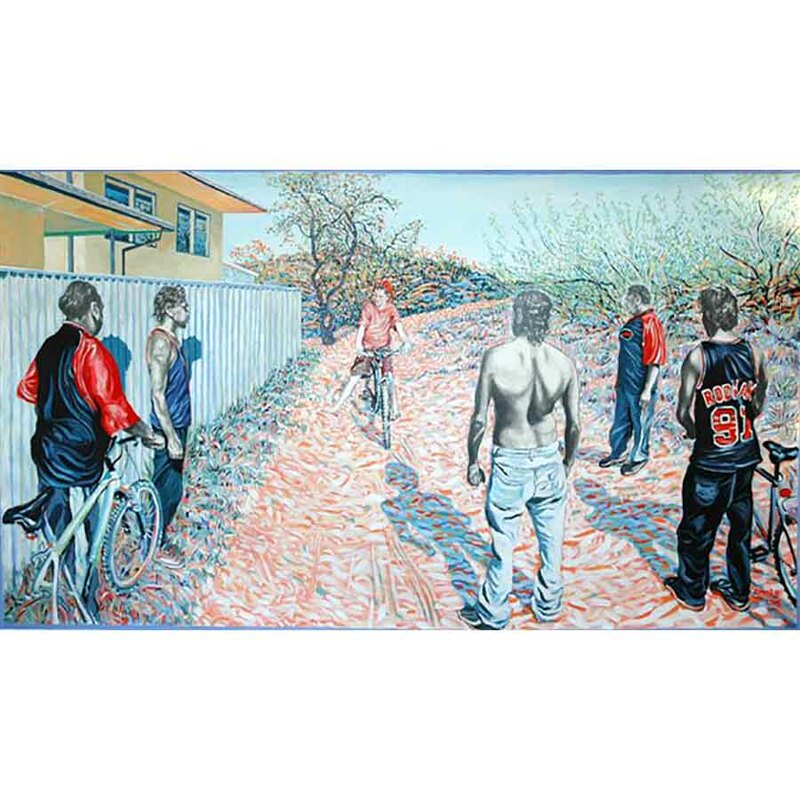 What would a contemporary Indigenous youth see? Perhaps a landscape at variance with that surrounding him? Possibly ghosted members of an earlier generation. I wanted to say something about the confusion confronting the present generation, the welter of imagery arriving through social media, the loss of language and relevance of much old story, the displacement from traditional ‘country’. When Jason Webb and I arrived at Wigley’s Waterhole where I’d planned the setting, recent rain had stirred the water and inadvertently, provided the answer. Jason’s reflection would be muddied. Maybe it was revisiting Camus’s, Last Man, which got me imaging Sisyphus. The Closing The Gap mantra provided the metaphor for the hero’s ceaseless rock-rolling to a mountaintop where it falls back on its own weight. I searched suitably scaled and colored rocks for Lachlan Webb to pitch his entire being against. As with all myths, new life needs to be breathed into them. Despite the persistent efforts to redress indigenous suffering none of us must submit to the Rock’s invincibility. Freeze-framing Sisyphus’s labour might enable contemplation of his torment. The struggle to ‘heights’ IS enough to fill our hearts, each atom of stone, each mineral flake of the night-filled mountain, forms a world. Friend and marathon devotee, Dr. Howard Goldenberg, regular participant in the Alice Springs annual marathon, posed for this (as Freud on the couch and a doctor listening to a rock rather than his patients in earlier works). 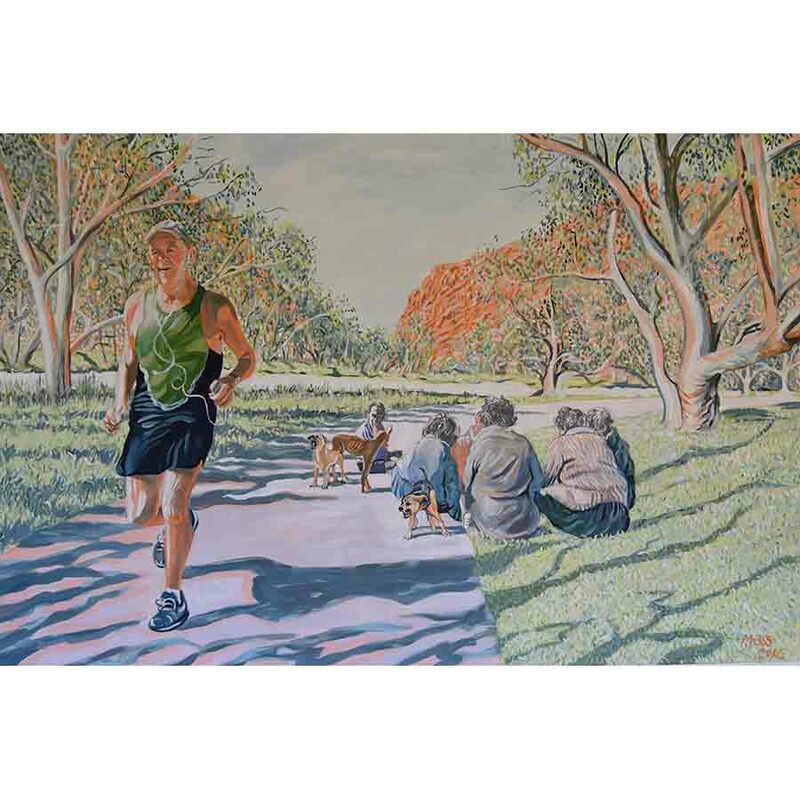 I’d thought to contrast the disparate recreational pursuits of the cultures re-describing a moment that recurs regularly on the shared riverside path coursing from the CBD south to Heavitree Gap. Without reviewing the history of settlement in Alice Springs since David Lindsay surveyed it in 1888, the town has grown on and about its original grid. It’s social problems are no secret and its persistent social divide, by and large of racial character, have been the subject of much of my work, not to mention regular airing in popular media and literature. In a work pre-dating this I’d pictured a similar group of Arrernte, the original custodians of Mpwernte/Alice Springs, bemused at discovering a rondel of casked wine in the dry riverbed of the Todd rather than the mythical inland sea, so desired by C19th explorers in search of mineral and grazing potential. Here, the very town itself is the unearthed object with its western grid, alien to the natural acreage surrounding it.